Agar firdaus bar roo-i-zameen ast, /Hameen ast o hameen ast o hameen ast (If there is a paradise on earth, It is this, it is this, it is this). This is what Amir Khusro, a great Sufi musician, poet and scholar once said about Kashmir. Famous for its breathtaking greenery and snow-covered peaks, Kashmir has a rich culture and crafts tradition. One of the most integral parts of Kashmiri cultural identity – such as Koshur (the local language), Wazwan, shikaras, houseboats, Noon Chai, kangri – is the pheran. Stroll around the Kashmir Valley and you’ll spot people wearing this ankle-length or knee-length dress, either holding kangris (10-inch tall earthen pots filled with glowing charcoal and encased in handmade wicker baskets) in their laps or tucked inside their dress to keep warm. This traditional outfit is widely worn by men, women and children irrespective of class and religion in the valley. There’s a good reason behind its popularity – the combination of pheran and kangri, after all, is a perfect way to survive Kashmir’s freezing six-month long winter. 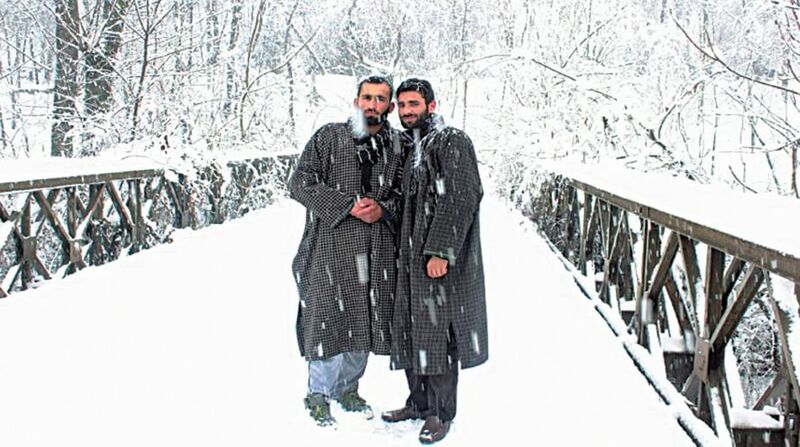 Every year, almost every Kashmiri makes it a point to get a fresh pheran made. A pheran requires at least two to three metres of thick wool fabric and the average cost is 400 Indian rupees (700 Pak rupees) per metre. Given the population of the Kashmir Valley, it means locals annually use two million metres of fabric on Paet pherans and spend eight billion Indian rupees (almost 14 billion Pak rupees) on them. Unfortunately, despite such an economic benefit, not a single metre of wool or cotton is produced or manufactured locally in the valley. Every single metre, along with the thread used for stitching, is imported from the Indian Punjab, Delhi and Mahrashtra. There has not been a serious initiative on the part of the local government to set up local factories for this purpose, neither have the people themselves picked up such entrepreneurship with the ethos of political uncertainty they exist in. Pheran has also become a symbol of Kashmiri identity and political conflict amidst all other social, cultural and aesthetic changes that have taken place in the region. After militants were found concealing arms and ammunition in their pherans, Indian law-enforcement agencies, labelled it a dress of ‘rebellion’. But what is the origin and history of this dress that has captured the public’s imagination? Derived from the Greek word meaning ‘apron’ or the Tajikistani word peraband, pheran’s origins can be traced back to the Mughal era, where the royal style of this long garment was in use. Some say it was originally designed for women so that their figure was not revealed. However, because of its distinct design and beautiful style, over time, the dress has become trendy. There are mostly two types of pheran: one is made of either cotton or a thin but expensive wool and is worn throughout the year, especially by women. The other, paet pheran, is a warmer garment made from thick wool and is worn during the winters. While both men and women wear this dress, there are subtle differences between the genders: women usually wear pherans that are embroidered; men, on the other hand, wear simple pherans with no adornments. These differences can be seen among different religious groups too: Muslim Kashmiri women wear knee-length pherans, with broad sleeves, while Hindu Kashmiri women wear ankle-length pherans, with narrow sleeves. For Kasmiris, the pheran isn’t merely a showy outfit or something to keep warm, it can also be a prized heirloom. “Our brides get special pherans sewed as a lifelong souvenir from their parents which may cost as much as 10,000 rupees,” points out Najar. Kashmiri refugees and immigrants take their dresses along with them wherever they go and that is how the pheran has made fans along the way. Sadia Usman, an Islamabad-based TV host and writer, says she loves pairing the outfit with jeans and sneakers and is always on the lookout for unique designs. “Kashmiri pherans for girls are elegant and absolutely stunning, especially the ones embroidered with aari work,” she says.